Apologies to regular visitors. My PC has died on me (suspected motherboard problem), so I can't update from home. And I don't have time and I should not update during office hours. Besides all my photos and notes are on that PC, so I don't have much reference material. So, I am going on forced hiatus until I can sort something out. In the meantime keep on checking, maybe by then my PC would have been cured! Bandar Seri Begawan - Brunei's famed 644-million-dollar amusement park - Jerudong Park Playground - will relaunch this weekend after being "virtually dead" for years, park officials said Friday. Opened in 1994, the Playground was once billed at the largest amusement park in South-East Asia, boasting lavish rides, entertainment venues and a free admission policy. The government hoped the multi-million-dollar extravaganza would attract thousands of foreign tourists to the tiny oil-rich nation, but the response proved disappointing. To cope with the smaller-than-expected foreign market, the Playground's administration started charging admission fees and started a ride ticketing system a few years ago, which turned off Brunei visitors. Exactly 47 years ago today, some people thought they heard fireworks. They were wondering why fireworks? Thy did not know that it was not fireworks that they heard. It was the sound of small arms fire. A group of people decided that they needed to take matters into their own hands. I was a two month old fetus in those days. My mother told me that she and my father had to sleep on the floor in case any stray bullet went through their wooden government quarters in Kuala Belait. One uncle told me that he was almost shot at by another uncle when he as members of the armed guards of BSP went to the Panaga Police Station to take refuge. The police shot at them because they thought the guards wanted to attack the police station. 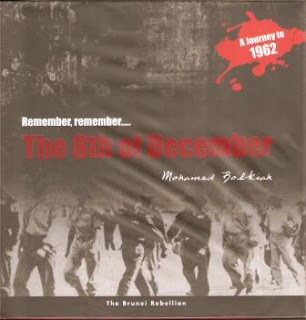 What I know about what happened 47 years ago was what I heard and read. A number of books had been written about it. Today my entry is about those books which you can go to the bookshops and buy them for yourselves. * Pesta dan Pertunjukan Kereta @ Kompleks Dewan Kemasyarakatan (from 9 am to 10 pm), today is the last day. It started on Friday. * Pesta Pengguna @ Petani Mall (from 10 am to 10 pm), it started yesterday and will go on until the 13th December. * Pesta Produk Mukim dan Kampung @ Kompleks Pasarneka dan Tamu Tutong (from 7 am to 5 pm), this one too started yesterday and will end on the 9th December. * Cabaran 4x4 @ Kawasan Lapang Berdekatan Mahad Islam (from 10 am to 5 pm), watch the 4x4 SUVs compete, started yesterday and will end today. * Kebudayaan dan Kesenian @ Kompleks Pasarneka dan Tamu (from 9 am), this is a two day event with a number of shows from various groups, today is the second and last day. 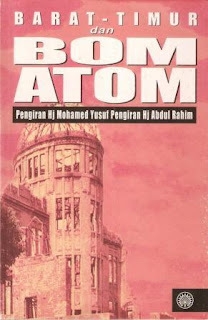 I remembered when I was in Darjah 4 way back in the very early 1970s, one of the fahaman article or comprehension I was reading had a story about a Brunei man during the aftermath of the first atomic bomb in Hiroshima. Apparently he had been a student there and the bomb fell over the city. Luckily he survived the bombing. After that I searched high and low for the book but to no avail. At that time I didn't know who the author was let alone from which book was the excerpt taken from. About three years ago, I was in Mega Book Store. That's a free plug for the bookshop. I found this book written by Pengiran Yusof. I am 46 years old now and of course by now I know who he is and that he was the one who was in Hiroshima when the bomb was dropped by the Americans. I glanced through the book and lo and behold, that narrative was in the book. I quickly bought it, it was only $9.60. Someone asked in the comment box whether I could write something about pantang larang of Bruneians. I could. But then why would I do that? There is a book that you can actually buy and read all about it. 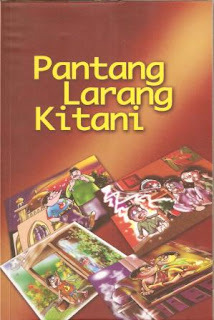 This book published by our Dewan Bahasa in 2006 contained all there is to know about the do's and dont's of our society or rather the dont's of our society. All the pantangs are listed in alphabetical order and altogether there are 115 of them (I counted). They range from 'Anak perempuan dilarang bermain permainan lelaki kelak sigau' to 'Tidur atau baring di atas batang besar ditakuti ditolak hantu kagui'. For each pantang, there is a reason given and what lesson the pantang was supposed to teach. And there are also illustrations for a number of them. I was looking through my father's old album searching for photographs to illustrate my third book when I came across this photograph. 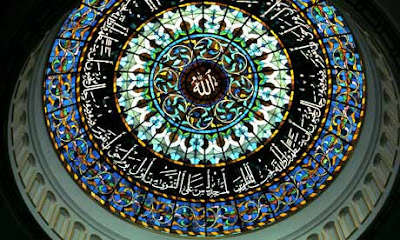 I thought this will go nicely with the maulud article in that book. My father was an Assistant District Officer in Tutong in the 1960s. You can see him in the middle of the photograph in white with his interesting long shoes. That shoe we used to call as kasut pembunuhan. I don't know why. I thought it has gone out of fashion until I saw someone wearing it recently. Anyway, the photograph is not so much about maulud but it is more about Tutong. If you look at the background, you can see old shops. That shophouse building has been torn down, someone told me burnt down, whatever it is, it has been replaced. The interesting information is that Kedai Haji Hasbullah, the famous maker of pulut panggang is still there. Remember these names? Sinin Metali, Aloysius Sibidol, Zainab Kadir, Junaidi Hamdan, George Chong, Abdullah Mustafa, Sanah Tamit, Pengiran Md Zain, Katherine Teo and Marina Metali? If these names do not jog your memory, then what about Latif Olen, Kuda Dita or Dilbaugh Sinkler? 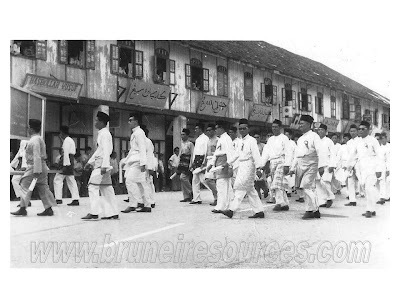 Bruneians in the 1950s and 1960s interested in sports would remember that these were Brunei’s and some of our neighbouring states’ best athletes competing in the Borneo Games. Borneo Games was the most prestigious athletics competition that we had at that time.